Universal Scooter Tool for common 50cc to 250cc engines found in Minarelli based scooters, Franco-Morini (TGB, Suzuki, Pegasus) Scooters and more. 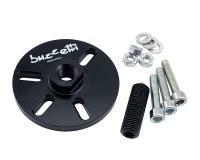 Buzzetti universal 3-point puller for alternator rotors. The 3 screws included in the delivery are simply screwed into the holes in the rotor. Then the central clamping bolt separates the rotor from the crankshaft. Thanks to the 3 long-shaft holes in the puller plate, this tool is almost universally usable with multiple types of rotor. Suitable for Minarelli, Morini, CPI / 2-stroke China engines and Aprilia/Suzuki engine.